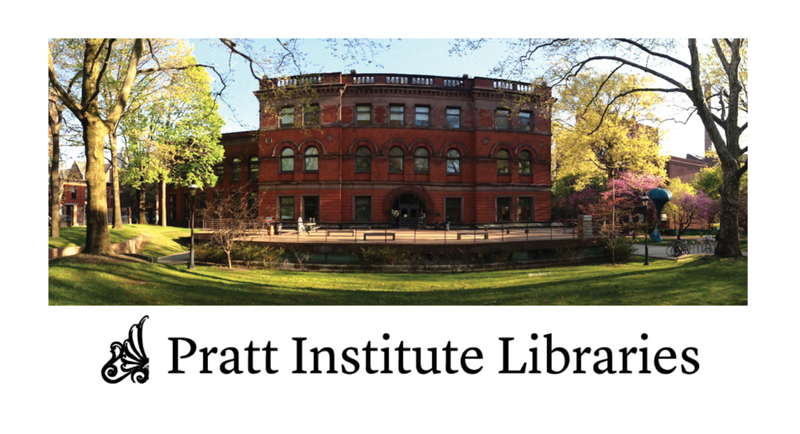 Given that Pratt Institute Libraries serves a variety of users within the Pratt community, understanding the behaviors, attitudes, and expectations of users in and around the library and its services is integral. This case study focuses on the physical space aspect of the project, enhancing the user experience within the library through seamless wayfinding and a harmonious atmosphere with appropriate resources. MY ROLE: I primarily worked on UX Research, designing and conducting surveys and interviews, as well as the creation of our research deliverables (personas and journey map). I later worked with a team focused on the in-library experience which consisted of physical space recommendations and a companion mobile app. Within this team, my main role was in leading the physical space recommendations. 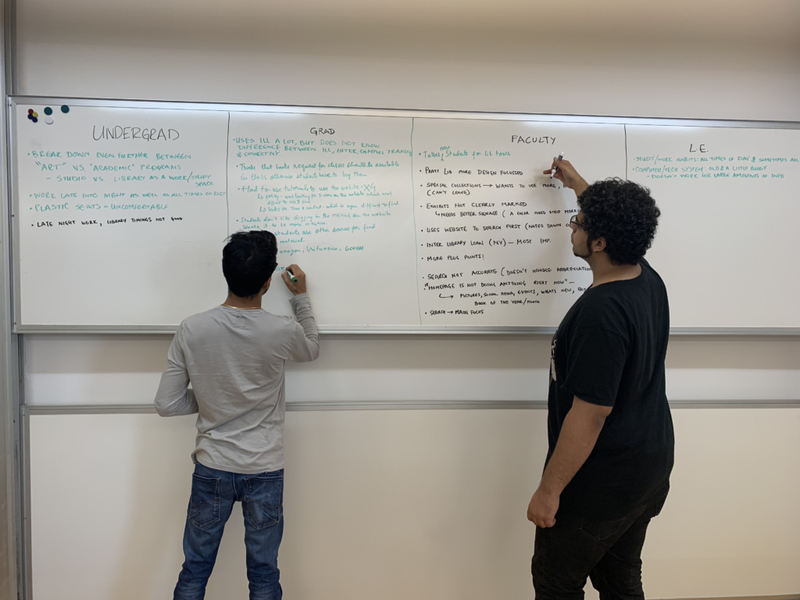 With the goal of discovering library users’ expectations, perceptions, likes and dislikes, and level of awareness of library space and services, my team conducted user research in the form of surveys, and interviews. Data was gathered from 150 survey responses which were obtained digitally via email as well as in-person at Pratt Institute campuses.  Semi-structured interviews were conducted with a variety of members within the Pratt community: students (both graduate and undergraduate), faculty, and library employees. Out of the 30 total interview participants, some interviews were scheduled, a couple were collected via email through a questionnaire format, but most were conducted guerilla-style on the Pratt Institute Brooklyn campus. 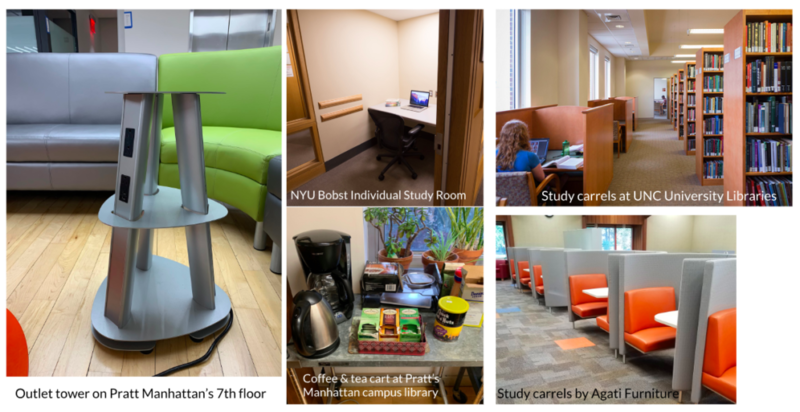 Research specifically focused on the physical space was conducted by another team through six on-site observations using the POEMS Method which calls for data collection on People, Objects, Environments, Messages, and Services. 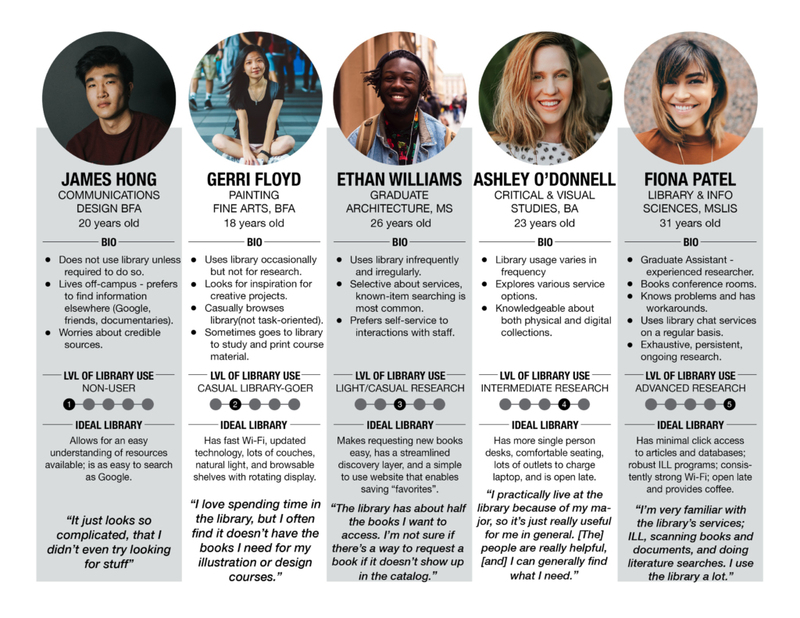 From this we developed personas which aided both our in-library experience team as well as other teams that handled the website redesign project. It’s important to note that although our personas depict students, we defined the main categories to break away from the student vs. staff vs. faculty mentality. These personas should serve as guidance on the attitudes and goals of the Pratt community as a whole. After our teams collaborated on research findings, we shifted gears and broke into another set of groups to undertake various proposals to enhance the library experience. I led the the physical space recommendations proposal. Taking what we learned about users’ experiences within the physical space, our team visited the library two more times focusing on the library’s signage system and areas for improvement. 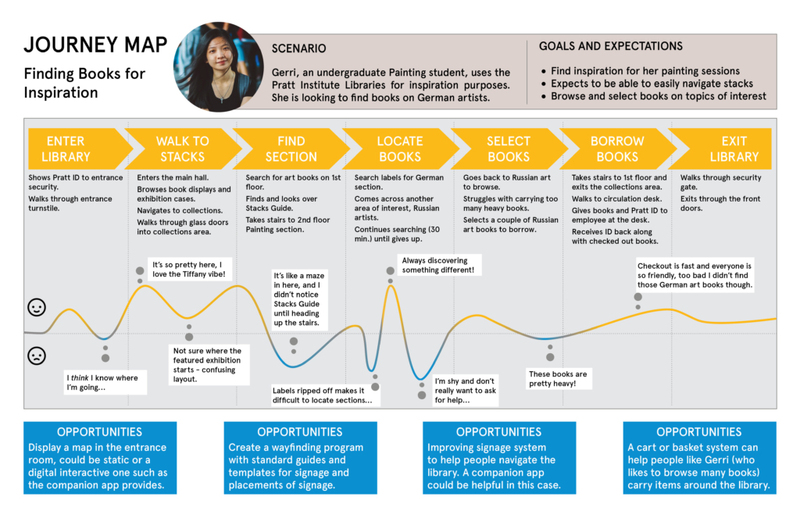 To help inform our recommendations for the Pratt Libraries physical space, we developed a user journey map based off of our cumulative research findings, employing real user scenarios and quotes. The opportunities highlighted along the journey map place an emphasis on improving the library’s signage and wayfinding system as well as offering tools to help library visitors along their journey, such as carrying baskets to lug heavy books around. Take stock of current signage (this can be done through a signage audit) and categorizing signs by purpose (Directional, Informational, Regulatory, etc.). 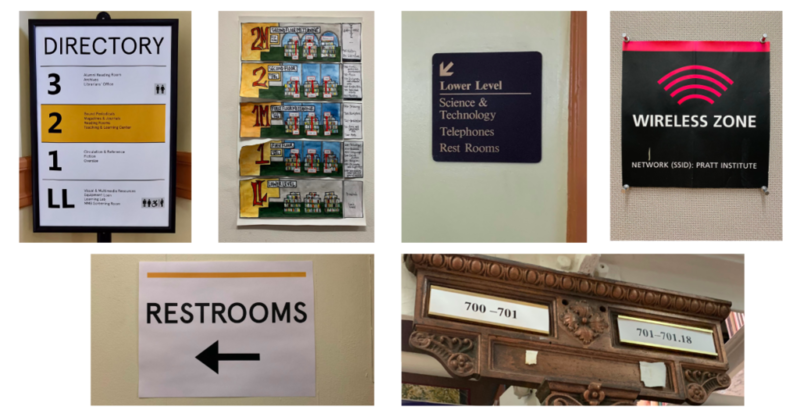 Sign types should be visually distinct from one another which will help users know what kind of information a sign is providing with just a quick glance. Templates can help structure and provide a cohesive style while also enabling consistent and appropriate use of visual elements such as color, typography, and logo. These should adhere to the Visual Strategy Guidelines to ensure consistency across digital and static visual displays. Ensure an all-around positive experience by communicating information in a welcoming manner (especially important for regulatory signs). Consider which signs you may not need and that can be handled in person (e.g. “no smoking” signs), as too many signs can decrease the effectiveness of a signage program. Ensure that signage reflects the professional standards and attitudes of the environment, avoiding paper signs taped to walls, doors, desks, etc. as they tend to wear out after a short period of time. Because the Pratt Institute Libraries serve the Pratt community as a whole and provides space for other organizations within Pratt to share their voice in various flyers and informational posters, it is all the more important for the library to have its own signage program, establishing the unique voice, personality, and brand of The Libraries. 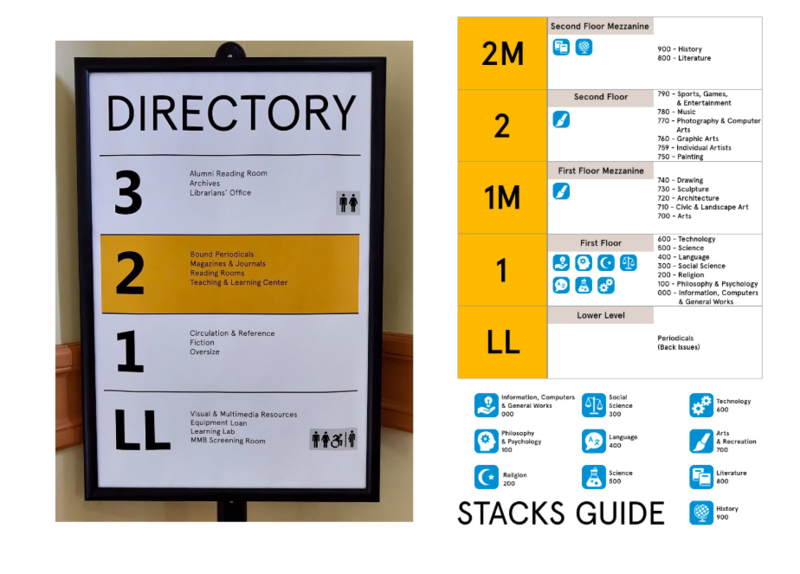 We designed an example concept for the Guide to the Stacks that employs similar visual language to the Directory, using color and typography from the Visual Strategy Guidelines and icons to help distinguish between subject areas. A further step would be varying icons by color, but color accessibility must be considered when doing so. A goal for our final client meeting was not only to present our findings, designs, and recommendations, but to also provide our stakeholders with insight into our research and design process. 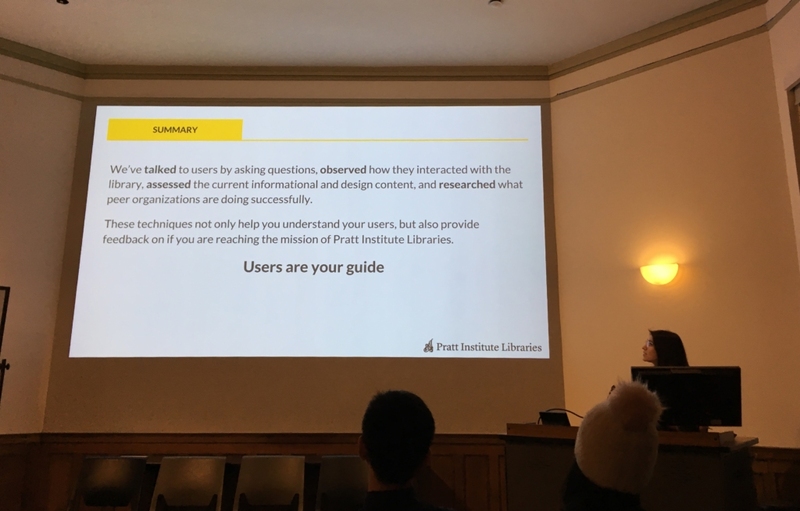 We hoped for them to come away with an understanding of how to carry out this research in the future so that the librarians themselves could implement UX practices, consistently enhancing the Pratt Institute Libraries experience over time. 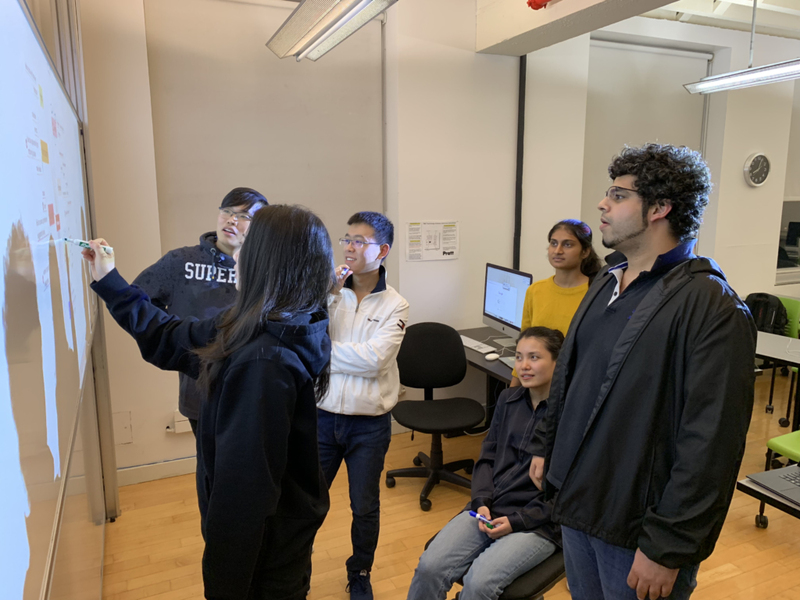 This case study focuses on just a portion of the Pratt Institute Libraries project, as other teams worked on designs for an updated website, content strategy, and an in-library mobile companion app. From our analysis of user research it was clear that library users have a lot to say about the physical space, which is why we gave it it’s own documentation in our deliverables. Sometimes it’s the foundational aspects that are forgotten and become neglected. 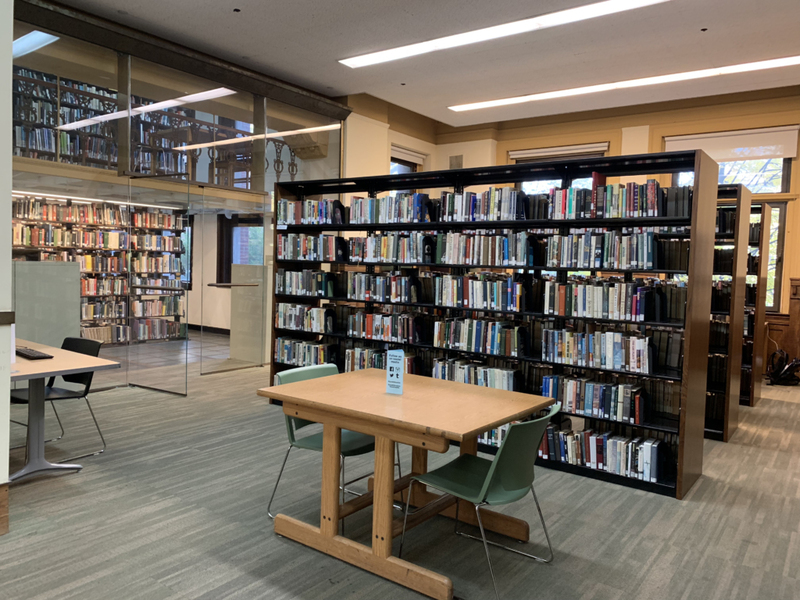 In the case of Pratt Libraries, it seemed that they were primarily focused with a website redesign that when we presented physical space recommendations it was like a veil had been lifted and they were seeing their everyday environment anew. As one librarian exclaimed “Baskets! Why didn’t we think of that!” This is the power of placing user research at the forefront of design decisions. UX research techniques will not only help stakeholders understand their users, but also provide feedback on whether or not they are reaching their goals and mission. 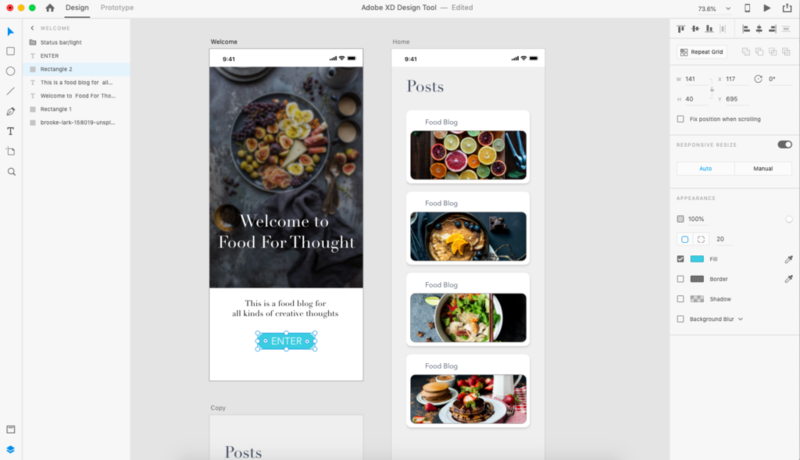 During my Projects in IXD class last week, I presented a live walkthrough of some of Adobe XD’s most useful features and design modes, all in seven minutes. I wanted to share the ease of which one can learn Adobe’s design tool and how smoothly the program carries out complex tasks in the blink of an eye. As we move into the ideation phase and are ready to start prototyping, we’re confronted with a number of powerful design tools: Sketch & InVision, Adobe XD, Figma, Balsamiq, or just good ol’ pen & paper. But how do we know which one(s) to go with? When choosing a tool, it really comes down to preference, what works for me won’t necessarily work best for you and vice versa. But it helps to know a little bit about the options available, making it easier to choose the best fit for your project needs. Adobe XD (Experience Design), part of Adobe’s Creative Cloud, is a high performance UX design tool that helps create beautiful user interfaces as well as streamlining the user experience. Operable on both Windows and Mac, It allows you to design, prototype, and share your creations. You can share prototypes with stakeholders for feedback and validation, then share the design specs with developers. Being part of the Creative Cloud, XD allows easy integration of Photoshop and Illustrator files, as well as exporting into After Effects to create more advanced animations. XD can also open Sketch files, but this is still being improved upon as not all elements will translate between programs. A subscription to XD alone is $9.99 per month. Adobe also offers an educational discount on the Creative Cloud, lowering it’s monthly price from $52.99 to only $19.99. Better yet, some universities such as Pratt Institute offer FREE Creative Cloud subscriptions through student and faculty accounts. Where I used to be paying a monthly fee, as Pratt student I’m now paying nothing for the same services and features. Unlike most of Adobe’s programs, XD’s interface is minimal with easily discoverable functions. It’s main components are the design tools panel on the left with the assets and layers at the lower left, the artboards front and center, the property inspector panel on the right, and the modes and sharing options on the top bar. A handy option is to show grids over your artboards. This helps with the precision and placement of objects, easily snapping them into place. 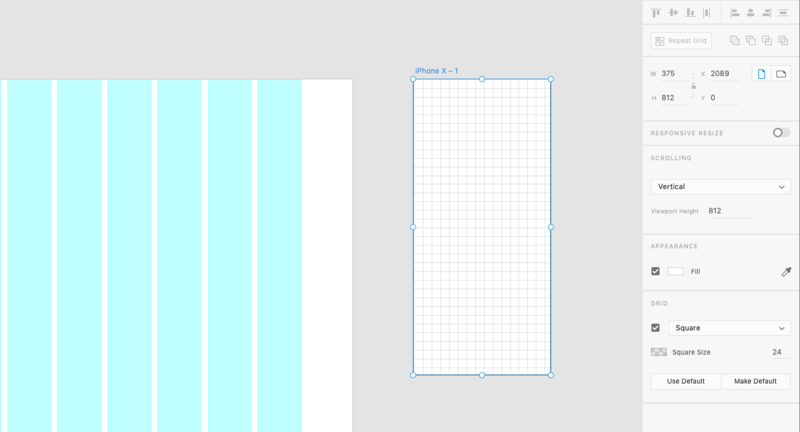 XD provides square and layout grid options which can be adjusted in size to fit your preferences. A tool that helps overcome the tedious task of repeating elements through copy and pasting, XD provides the Repeat Grid feature, accessed in the property inspector panel. This allows you to duplicate an element or set of elements by simply clicking and dragging. Similar with the Repeat Grids in creating a friction-free experience, XD supports the flexibility to import large amounts of content such as text and images. Once you’ve selected the area where you’d like import items, you can drag text or image files from your computer directly into the selection and XD will scale the content across the design. In keeping with a streamlined experience, you can easily jump from design mode to prototype mode to create interactive shareable prototypes by connecting artboards and elements. It allows you to add transitions, animations, overlays, and now with a recent update (October 2018) prototype mode enables voice triggers and speech playback. Along with previewing a prototype, you can record the interactions and save directly to your computer. XD enables sharing across various devices and platforms (Windows, Mac, iOS, Android). By clicking Publish Prototype or Publish Design Spec, the program will generate a shareable link which can be sent out for feedback and validation. Adobe XD has come a long way since it’s 2016 beta version. 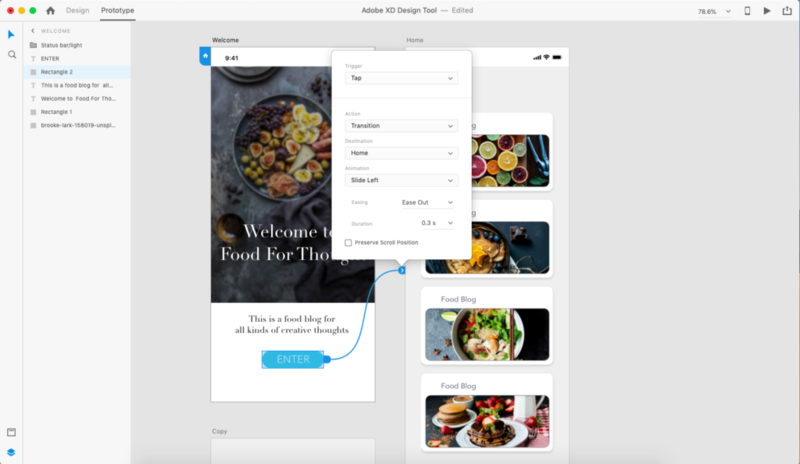 Constantly improving and releasing powerful features, Adobe is increasing its competitive advantage in the world of UX design tools. There are still many other tools that are just as effective and efficient, (Sketch being the main competitor) and gathering basic knowledge about a few different ones can help with deciding which one will work best for you and your team. Everyone loves a good story, it’s how we connect and communicate with one another. Storytelling in user experience is no different. The benefits are more than just communicating and connecting with your audience – by approaching UX through the lens of a storyteller, one can significantly strengthen both the presentation as well as their own understanding of research and findings. Offering a way of communication: Stories offer a different way of communicating with each, whether between clients and UX professionals, or the various teams involved in the research process. People are more likely to remember stories: More memorable than plain facts, stories make information easier to digest. Cognitive research has extensively studied the impact of storytelling on a person’s ability to retain information and how we learn new things. Stories can be persuasive: One of the most powerful tools of storytelling is the ability to inspire people into action, they can positively impact how users interact with a product or a brand, or persuade clients to make changes for improvement. They entertain: Stories capture attention. Typically, a site/product has around 10-20 seconds to grab a user’s attention before they leave and move on. Stories offer a way to draw users in through entertainment. They create shared experiences: Stories are more than just a transfer of information, they help build connections with the audience. When stories bring relevance to the lives of their audience, they’re drawing on the concept that people are not logical creatures, rather we engage through our emotions. Now that we’ve addressed some of the benefits of storytelling, how do we incorporate them in UX? 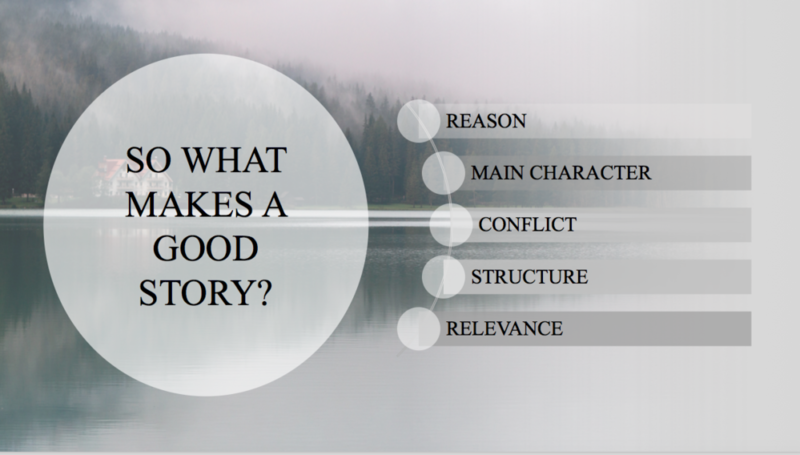 Below are the key fundamentals to telling a good story. The most important fundamental of storytelling is the WHY. Start by addressing why you are doing what you are doing. What is the main point you want your audience to take away? Without a reason, you have no story. The main character is the hero of the story. The hero is not you, or the brand or product, the hero is the user that you are serving. You are there to assist and help the user through their journey. You are the Alfred to their Batman and you help the user get things done (Dan Nessler, 6 Storytelling Principles to Improve Your UX). The conflict is where you illustrate a point of pain. This helps your team see a problem from the user’s perspective. UX is all about seeing from the user’s perspective, it’s about finding and resolving the conflicts that they deal with. This is how the story will be organized. The most common and successful method is the three-act structure (beginning, middle, and end). This can align with customer journey mapping and can help you understand the users’ motives and end goals. A good story creates awareness in the listener by sharing something they can relate to. As previously stated, people are not logical, we engage more when our emotions are involved. Stories unite ideas with emotions. The goal is to tell a story that triggers emotion in the hopes that the audience will walk away with a positive experience and a desire to share those experiences. Storytelling in UX combines the power of cognition and emotion. 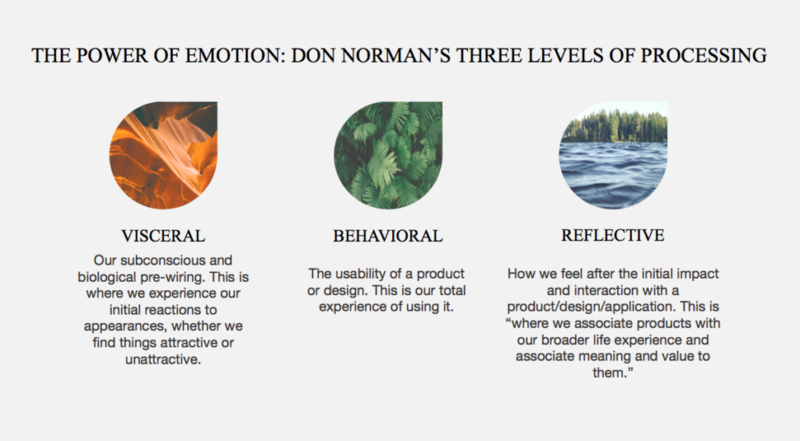 Don Norman expands on the power of emotion through his three levels of processing: visceral, behavioral, and reflective. But maybe storytelling isn’t for everyone, some people may not feel confident enough in their ability to tell a good story. 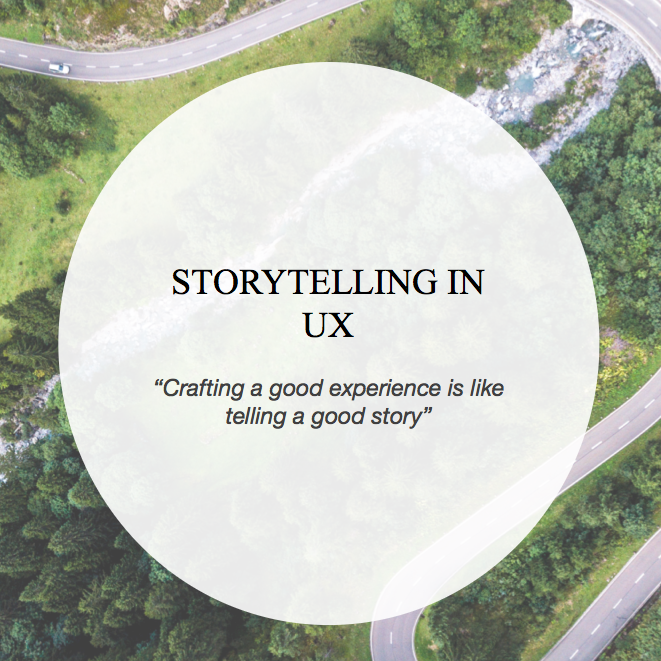 The great thing about storytelling in UX is that it doesn’t require you to have a background in creative writing or literature, stories are being told through various methods currently commonplace in UX design and research. User personas, journey maps, interactive design elements, scenarios, and gamification are just a few examples. These methods offer ways to visualize and organize your findings and research and they serve as storytelling elements. A story is just another way to frame user experience, and a compelling one at that. 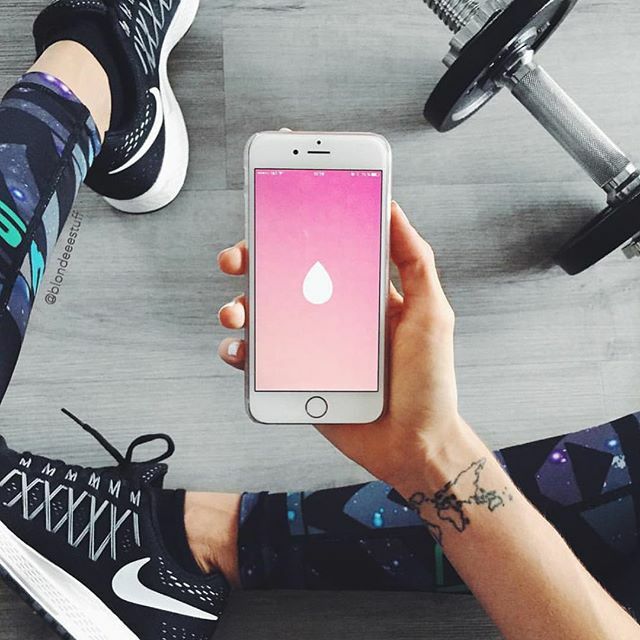 Sweat is a fitness lifestyle application created by Australian personal trainer Kayla Itsines. 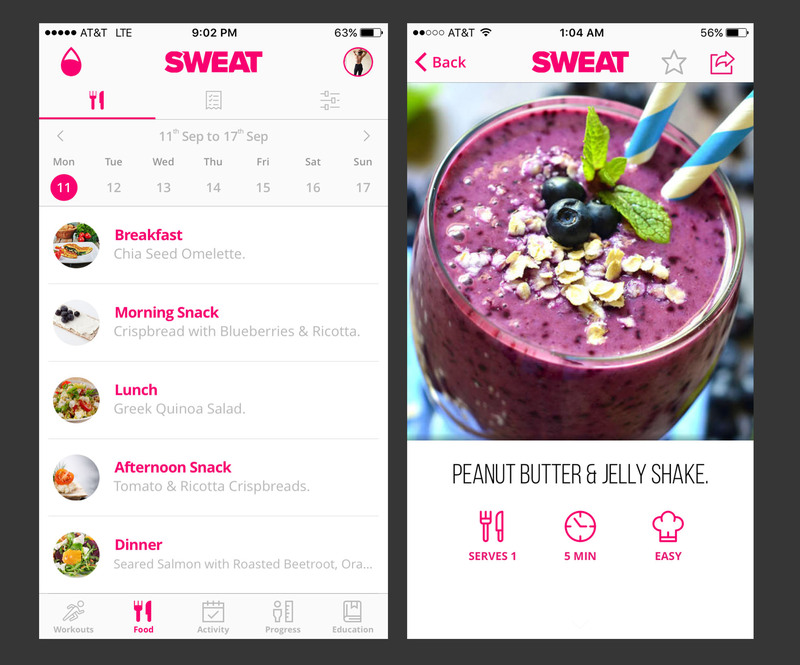 The app is based on her world-famous Bikini Body Guide (BBG) training program and her healthy meal guides. 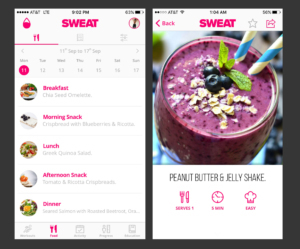 It provides workouts and meal planning all within a mobile device, acting as both a fitness instructor and nutritionist. 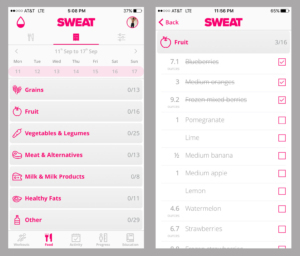 This critique focuses on aspects in the “Food” and “Activity” modes of the app. 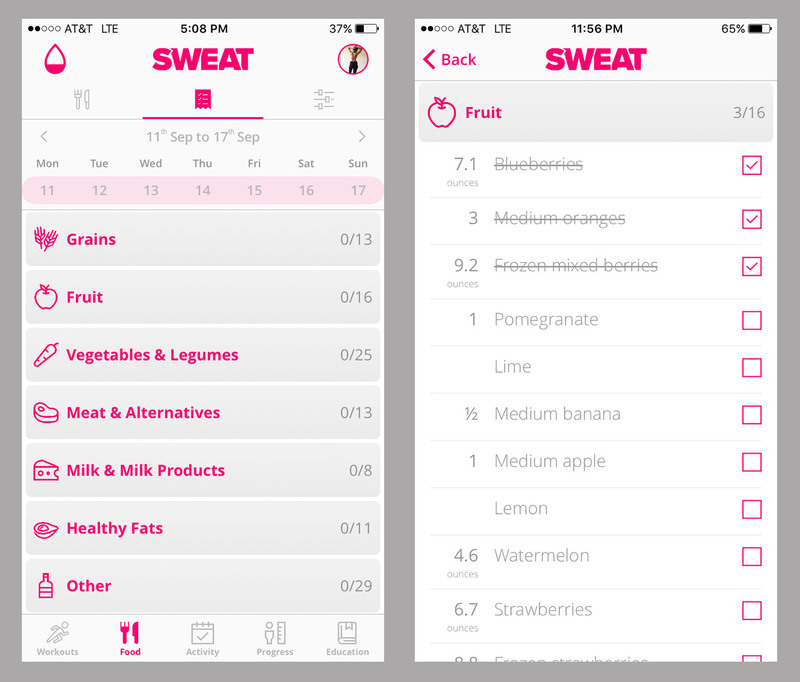 One of the most complex, yet well-designed areas of the app is the “Food” mode. The section employs strong use of signifiers, communicating where and how an action takes place, in this case by tapping and swiping. Meal options are available for each day of the week, and the arrows above the week signify that the user can view meals for previous or future weeks. To view a recipe, just tap on the meal. The checklist icon brings the user to an overview of groceries for the week. 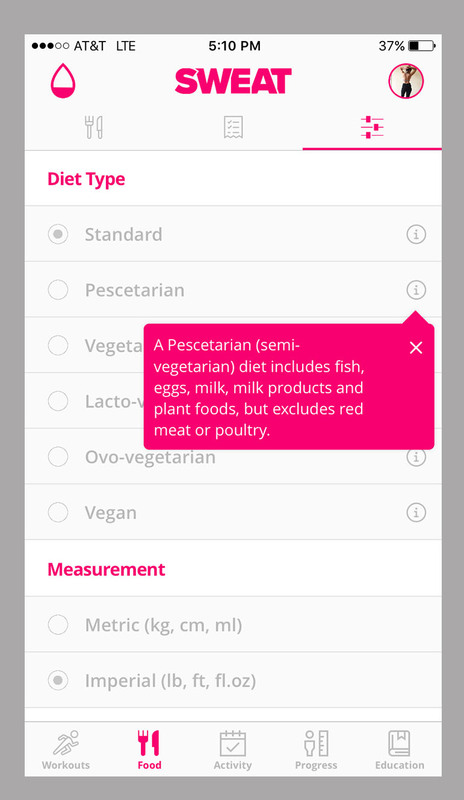 By tapping on a food group item, a detailed list appears for that group. Checkboxes to the right of the list signal that tapping one will fulfill that requirement and the user receives feedback with a checkmark in the box and a line through the list item. 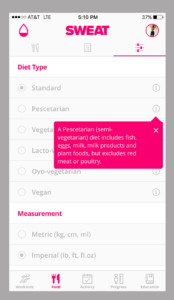 A conceptual model is formed by this grocery list layout, and in providing the knowledge of what is needed for each meal, the app reduces the need for knowledge in the head. Another component of “Food” mode is the settings option. The settings provide flexibility for the user’s diet and their measurement preferences. This would be considered an inclusive design, in that many users can benefit from this section. The app’s design is complex with many functions, offering instruction from how to do a push up to how to make a chia seed omelette. Most of the app deals with good complexity. As Don Norman argues, “complexity is essential: it is confusion that is undesirable.” An area of the app where complexity turns into confusion is in “Activity” mode. 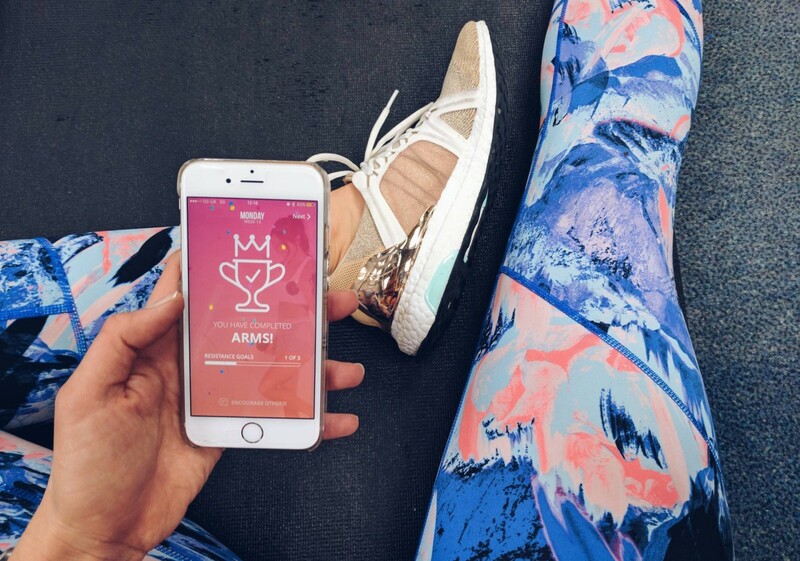 “Activity” mode lets users view their workout history and affords planning future workouts. I’m going to focus on an issue that comes up while viewing previous weeks. Say the user is in Week 3 of their program. 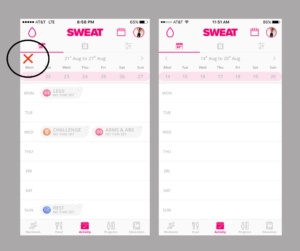 If the user taps the arrow provided at the top left of the screen next to the specified dates, the app will show the previous week’s history. 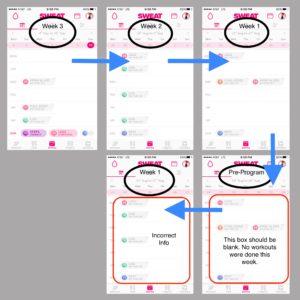 Say the user goes back before week 2, before week 1, and enters into the history for the week before the program started, this is where the app’s design fails. 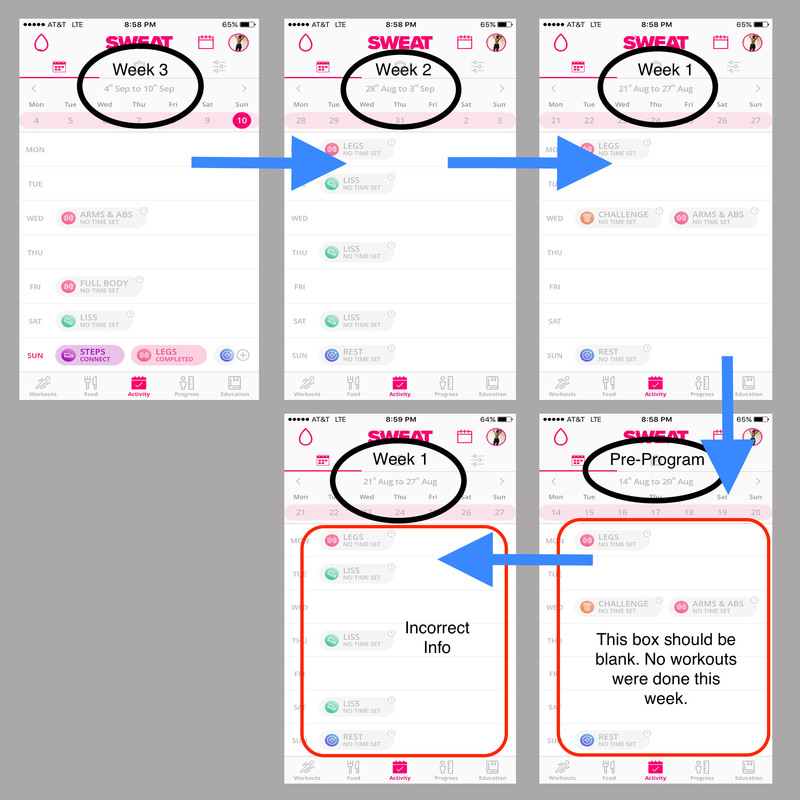 If the user views a week before they started the program, the app mistakenly transfers the information for Week 1 into what should be a blank week. This causes confusion for the user, so they try to backtrack. Now if the user tries to go forward in time (to Week 1 of the program), the app will show Week 2’s info on Week 1’s page. 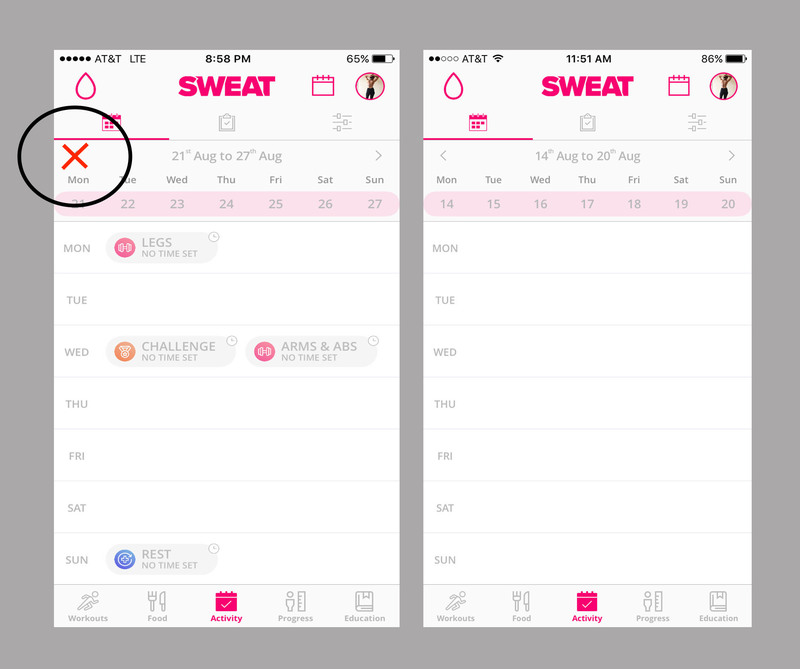 This causes the user to feel frustrated while trying to remember what exercises they did that week. A gulf of evaluation is formed when the user is confronted with inaccurate and inconsistent information. One solution can be to place a physical constraint, a forcing function (e.g. notice alert), if the user tries to view weeks prior to the program’s start week. This forcing function can be a pop-out box notifying the user that they are about to view weeks that are before the user’s start date of the program. Another solution is using a physical constraint to block the user from even viewing any weeks prior to Week 1 of the program. Make it so that the left arrow is absent on Week 1’s page, making it no longer a possibility for the user to go further back in time. And yet another solution is to keep all weeks prior to Week 1 completely blank, eliminating the user’s need to look further back. Through the use of signifiers, feedback, and conceptual models, the app’s discoverability and understandability is strong, but can be greatly improved with the use of constraints. Overall, good outweighs the bad for Sweat, but there’s room for upgrades.